The €-1796 calculator was introduced 2000 in a dark, translucent housing. 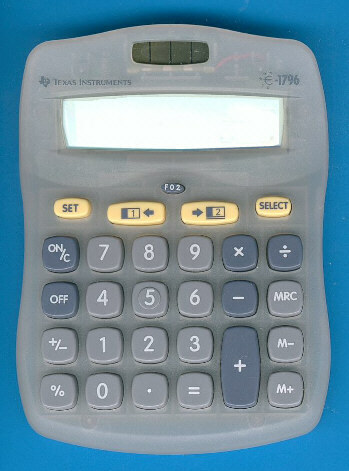 Nevertheless displayed the Texas Instruments website in the 2000-2003 timeframe a white housing like the TI-1796SV. When we asked Texas Instruments about a statement we received this early prototype. No doubt, it was a good decision to change the colour of the housing to dark blue.